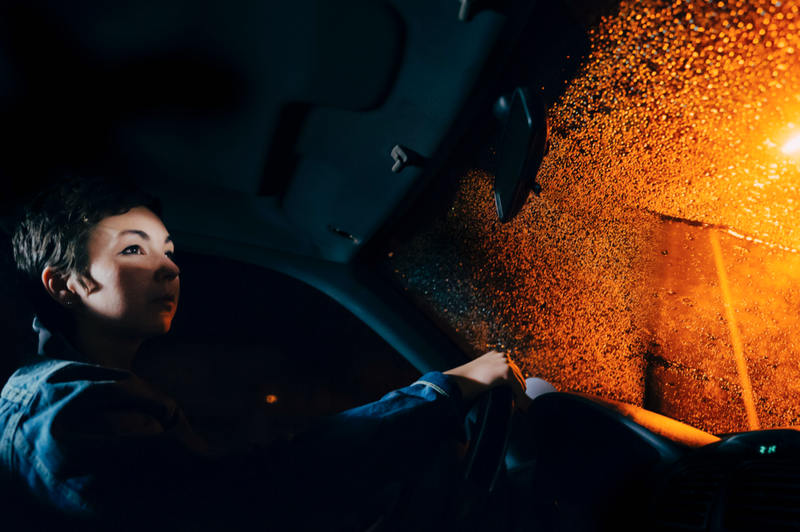 For this photo series we were looking to incorporated a couple different elements into a story: rain, driving, street lights and the feeling of caught in a storm. The story was very simple: our model Sarah driving home in the storm and catches the glimpse of head lights in the background. We ended up choosing two color images and one black and white. I wanted the composure of the model to feel strong and confident, as well as unafraid of the "light" behind her, as if it was a guardian or protector. For the image above we used continual light source ( video light ) to light the models face. I wanted the image to feel dim and gritty, so we pushed the image up to 6400 iso at 1.4 to have the rain freeze on the wind and car. For the back lights we used actual car headlights to flood the car and light the rain outside. For the above two shots we wanted the light of the "head lights to illuminate her face. We also wanted to show a "in the car perspective," allowing the view to feel right with her thus these two images were shot on 24mm. We allowed the orange light of the street light to flood the front of the car and with the video light in the background giving a sandwich affect.